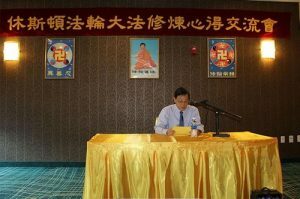 October 12, 2016 marks the 20th anniversary of Master Li Hongzhi’s visit to Houston, Texas, where the founder of Falun Dafa lectured on the Fa and was presented with honors from the City of Houston. 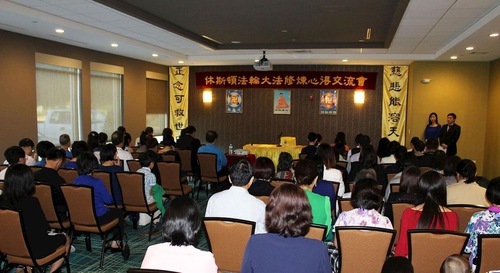 To commemorate this date, Falun Gong practitioners in Houston held a cultivation experience sharing conference on October 8. Attendees recalled Master Li’s historic visit to the city and presented talks about their experiences in Falun Dafa cultivation practice. Mr. Song, the contact person for the Southern USA Falun Dafa Association, recalled that cultivation conference 20 years ago, which was attended by 600 practitioners from the U.S.A., Canada, Germany, and Sweden. The city also named Master Li an Honorary Citizen and Goodwill Ambassador. Mr. Song said that Master Li talked for over four hours without a sip of water. Even during the 10-minute break, Master was busy chatting with students. Master Li had a very tight agenda in Houston. After giving the long lecture during the day, he moved to a hotel to give another lecture, albeit smaller-scale. Afterwards, students had their picture taken with Master. The next morning, several students gathered at the Houston Institute of Chinese Culture again to share experiences and practice the exercises together. To their delight, Master joined them and patiently answered all the questions they raised. After practitioners shared recollections of those memorable days, several practitioners gave prepared talks to share their experiences and insights gained through Falun Dafa cultivation practice. Mr. Song also talked about his experiences as a coordinator. He shared, “I have learned to give others priority, and communicate with every practitioner. I try my best to get everybody involved in different projects and make the best use of everybody’s expertise. A practitioner shares his cultivation experiences at the 20th Houston, Texas Sharing Conference. Mr. Pan talked about his experiences of coordinating the promotion efforts for Shen Yun Performing Arts when they came to Houston. He said, “Shen Yun has been invited to perform in many cities, and most cities face the problem of lack of manpower to promote the performances. Thus, there have been squabbles over manpower between cities. “As the local coordinator, I didn’t want to see local practitioners leave to help other cities. I sometime had conflicts on the phone with the coordinators in other towns, which often bothered me for several days after the phone conversation. “On the one hand, I didn’t feel that I was wrong, because I wanted to make sure that the local promotion was successful, but on the other hand, I told myself that such conflicts are loopholes, and the old forces will take advantage of us. Finally, I decided not to insist on my original plan, put down my attachments, and just face the difficulties. “I felt that it was the encouragement from Master. It was also a test to see if I really trusted the Fa. I realised that if I get rid of the selfishness, the wisdom I need will emerge. Mr. Zhang talked about his experiences of distributing the English version of The Epoch Times newspaper. The weekly newspaper came to Houston one year ago. Mr. Zhang initially encountered many obstacles in his efforts to distribute the newspapers. “We had two salesmen for the distribution of the English version, but both of them left for various reasons. Some practitioners suggested that we should probably give up the English version, at least for the time being. I believed that it was a test, and we should not give up. Conference attendees also watched the short documentary, Master Li’s Visit to Houston.